When hundreds of thousands of Iranians took to the street to protest against the presidential election results last month, many of them also flooded to Twitter, a popular social networking tool, to distribute information and voice their opinions. In the torrent of tweets from Iran, one voice stands out with its Persian prose and poetic power. 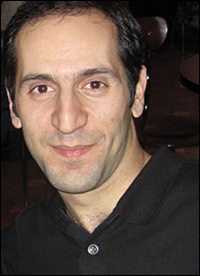 That voice belongs to Parham Baghestani, a 26-year-old engineering student and web developer from Isfahan. “My love has gone underground. The taste of night is nothing but awareness.” His tweets like this one caught the attention of NPR and landed him an interview on the Weekend Edition program. When poetry meets Twitter, readers are just one click away from the poet, but more importantly, the poet knows exactly who is following his words. He’s not alone, he’s within a network of readers, a network of support. “Poets are the refuge of every wounded nation,” Roger Cohen of The New York Times wrote. When their voices are silenced in official media during political turmoils, poets with a will to speak will find another outlet. In China, the country where I grew up, underground poets posted their poems on a wall along a busy street in Beijing during the democracy movement in the winter of 1978. Twitter is much harder to close down than a brick wall. A network of readers in cyberspace is much harder to dispel than a crowd on a street. Poets in Iran, one tweet at a time, shall always have their voices heard. Have you come across any poetry in Twitter? Do you know any other creative use of Twitter during the protests in Iran? What other technologies are useful in getting around information censorship? Please share with us by commenting on this entry.